With the coming of age (there had been Guides for 21 years by 1931) of The Girl Guide Movement it was decided in 1932 that every County should have a County Standard. On the Island Mr. Osborne of Ryde prepared our design. This was duly approved by headquarters and the embroidery undertaken by Island Guiders and two disabled soldiers. Executed in rich blue and gold the mounting was undertaken by Miss Jefford of Ryde. Next to the pole the Standard bears the Trefoil- the Guide badge signifying the three-fold Promise- the next section has the Vectis badge- the Girlguiding Isle of Wight County emblem followed by, fully across, Girlguiding’s Motto “Be Prepared”. The standard is then divided horizontally, with the upper section being bright gold and carrying the Divisional emblems of West Wight-a Laurentic Wreath and of North East Wight-a Dragon. The lower section of rich blue is emblazoned with the Ship of Central Wight and the Falcon of South East Wight. When completed the new Standard was dedicated by the Ven. Archdeacon of the Island (Dr. Robert McKew) at a special church service held at Newport Parish Church. Over 1,000 Guides attended the service held on 23rd January 1932 and in his address Dr. McKew said that the dedication of their Standard meant the dedication of their ideals and everything that they were to the Service of God. It was the plain, simple duty of every one of them, whatever her rank might be, to see that nothing mean, unworthy or base should ever disgrace or dishonour that Standard which they had dedicated to Almighty God. 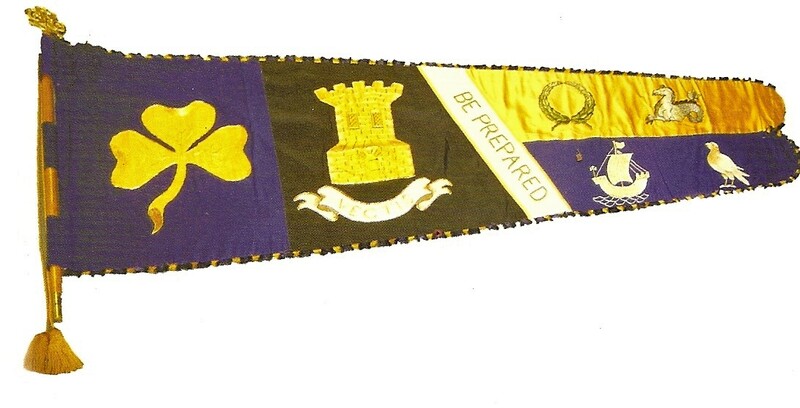 Following the dedication the Standard was presented to the County Commissioner Miss Brenda Blake who passed it on to the Colour Party with the words “Accept on behalf of the County this Standard which has here been dedicated, remembering the purpose for which it is blessed, the cause of which it is the symbol, and the honour in which it is held”.